SO SPACIOUS AND BEAUTIFULLY CONSTRUCTED IN 2008, THIS 7 BEDROOM, 5 AND ONE HALF BATH POOL HOME, ON 85FT OF DEEP WATER, IS PERFECT FOR ANYONE WISHING TO HAVE LOTS OF OPEN SPACE AND BEDROOMS (ONE BEDROOM CURRENTLY BEING USED AS A THEATER AND ANOTHER AS A GYM). THIS HOME ALSO HAS A DEN AND LOFT AREA, WOOD AND MARBLE FLOORING, CUSTOM REMOTE WINDOW SHADES, A LARGE ENTERTAINING BAR IN THE GREAT ROOM, FIREPLACE, AND POOLSIDE TIKI HUT! IT WAS BUILT ON PIN PILINGS AND HAS A POURED CONCRETE 2ND FLOOR. THE PERFECT HOME FOR ENTERTAINING AT HOME OR IT\'S JUST A FEW SHORT BLOCKS TO THE (SOON TO BE REDONE!) LIGHTHOUSE POINT YACHT CLUB FOR DINNER, TENNIS AND MORE! 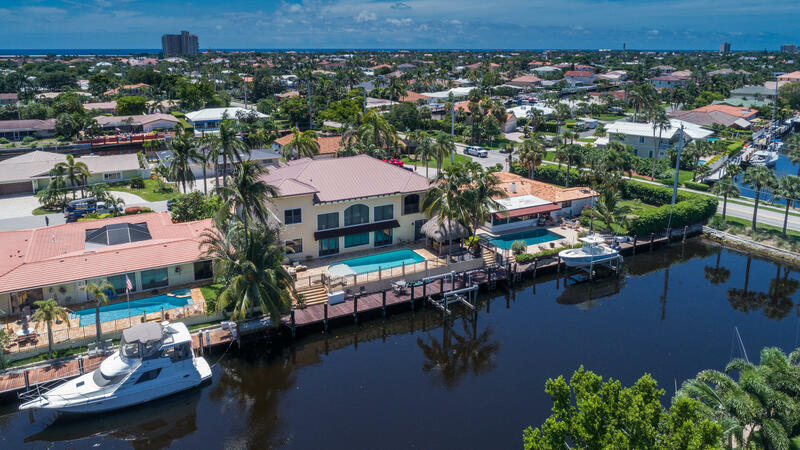 ONLY MINUTES BY BOAT TO THE HILLSBORO INLET, THIS HOME IS IDEAL FOR THE AVID BOATER OR FISHERMAN AND SEASONAL OR YEAR-ROUND BOATING LIFESTYLE!